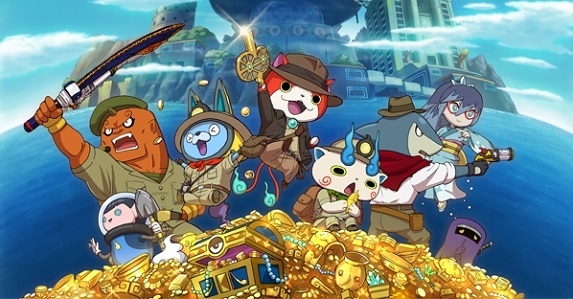 On this page, you will find everything there is to know about Software updates for Yo-kai Watch Busters 2: Hihou Densetsu Banbaraya – Sword / Magnum on Nintendo 3DS (originally released on December 16th 2017 in Japan). How to download Software updates for Yo-kai Watch Busters 2: Hihou Densetsu Banbaraya – Sword / Magnum on Nintendo 3DS? To check that you have the latest version installed, simply launch the game: the version number should be displayed on the title screen. Additional notes: unfortunately, we don’t know anything about this update, just that it provides various bug fixes. Players who download the update the game will receive some goodies: a 5-Stars Coin and 99 energy spheres. If you didn’t download Ver. 1.1.0, Ver. 1.2.0, Ver. 1.3.0, or Ver. 1.4.0 but download this update, you will also get the goodies for the previous update (Scroll of the Evil Princess and 5-Stars Coins) on top of the new rewards. Additional notes: unfortunately, we don’t know anything about this update, just that it provides various bug fixes. Players who download the update the game will receive some goodies: a 5-Stars Coin and 99 energy spheres. If you didn’t download Ver. 1.1.0, Ver. 1.2.0, or Ver. 1.3.0 but download this update, you will also get the goodies for the previous update (Scroll of the Evil Princess and 5-Stars Coins) on top of the new rewards. Additional notes: unfortunately, we don’t know anything about this update, just that it provides various bug fixes. Players who download the update the game will receive some goodies: a 5-Stars Coin. If you didn’t download Ver. 1.1.0 or Ver. 1.2.0 but download this update, you will also get the goodies for the previous update (Scroll of the Evil Princess and 5-Stars Coins) on top of the 5-Stars Coin. Additional notes: unfortunately, we don’t know anything about this update, just that it provides various bug fixes. Players who download the update the game will receive some goodies: a 5-Stars Coin. If you didn’t download Ver. 1.1.0 but download this update, you will also get the goodies for the previous update (Scroll of the Evil Princess and a 5-Stars Coins) on top of the 5-Stars Coin. Additional notes: unfortunately, we don’t know anything about this update, just that it will be available on launch day (and will most likely be required for online play). Players who download the update the game will receive some goodies: Scroll of the Evil Princess (allows you to befriend Damona, once your team is Level 20. Available until January 10th), and a 5-Stars Coin.